Trey Flowers made his first two NFL sacks on Sunday. 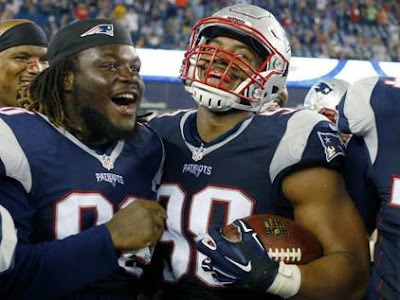 ORCHARD PARK, N.Y. – Trey Flowers appeared in one game during his rookie season and finished the season on the injured reserve. He didn’t register a stat last year. The defensive end got back on the field this season, but through seven games he was still searching for his first NFL sack. The 23-year-old can stop searching after Sunday’s performance against the Buffalo Bills. Flowers was the Patriots most productive pass rusher, finishing with two sacks. Afterwards, he said he hopes to build on the breakout performance. Flowers first NFL sack came at 13:55 of the third quarter when he hit Bills quarterback Tyrod Taylor for a loss of seven. Then at the end of the fourth quarter, with 1:47 left in the game, Flowers sacked Buffalo backup quarterback E.J. Manuel for a loss of two. A fourth-round pick in 2015, Flowers has been rotating in at defensive end along with Chris Long, Jabaal Sheard and Rob Ninkovich this season. On Sunday, we saw that Flowers has potential to be a good player in this league. He hopes that it’s just a sign of things to come. Trey Flowers, right, celebrates with Malcom Brown after recovering a fumble during a preseason game in August. FOXBORO -- In this family, you literally earned your keep. Summers weren’t spent slacking off, soaking in the sun or couch surfing. Instead, days started early and ended late. For Trey Flowers, learning about the real world came when he was only a child. Along with his 10 siblings, this Huntsville, Ala., native spent the summer months working for his father, Robert Flowers, who owns Flowers Construction Co. When he was really young, he was merely a helper, who gathered nails and various tools. By the time he was 10-years-old, he was learning how to build houses. He put up walls and hung shingles. At 12, Robert Flowers had a helper who was more efficient then some of the men he worked with. A house is only as strong as its foundation. It’s what the structure relies on over the years and what allows the building to last when times get tough. It was during these times when a foundation was set for Trey Flowers. The groundwork was laid early on. Trey Flowers has relied on that blue-collar work ethic all his life and does so now as he tries to make it in the NFL. 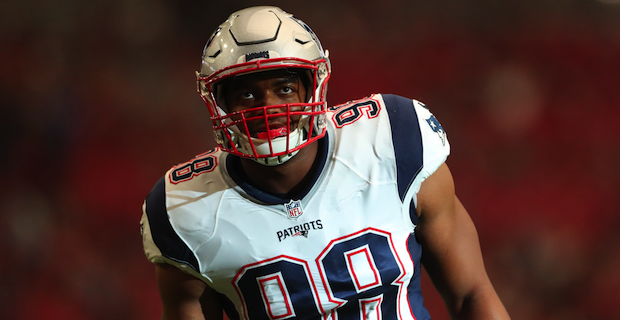 Before he ever stepped foot on a construction site, Trey Flowers was addicted to pushing himself. Robert Flowers loved challenging his children. One of his favorite ways was in the form of a push-up contest. With Trey Flowers, this started when he was 4-years-old. The father started his son off small – around 25 pushups - and had him steadily work his way up. As he grew older, the push-up challenge only intensified and could happen at any time, anywhere. While watching Alabama A&M football games, if Trey wanted something from the concession stand, he’d have to do pushups there in the bleachers. When his father had friends over, he’d brag that his son could do 100 and there his boy would drop to the floor. Trey Flowers never complained. He enjoyed the challenge. After all, he watched his older siblings do the same thing. He’s the seventh child in the family – some are half brothers and sisters. Among the siblings, he has five brothers - Jamal, Josh, Rod, Ced and Joshua – and four sisters - Jacqueise, Jazzmine, Summer, Shanequa. For Rod Flowers, nine years older, it was clear that his younger brother’s work ethic was unique. All the children in this family learned of hard work early and for some, it paid off in the form of athletic scholarships. Rod Flowers was the first brother to go to college, earning a basketball scholarship from Bob Huggins and Cincinnati. After transferring to Tennessee State, as a senior, he earned a tryout with the Tampa Bay Buccaneers as a tight end in their rookie minicamp. Then there was Jamal, who earned a football scholarship to Middle Tennessee, where he was a standout offensive lineman. Then his sister, Jazzmine, played soccer at Alabama A&M. Trey Flower’s lone SEC scholarship offer was from Arkansas and it came late in process. The staff discovered him through a Youtube highlight video and scouted him at a basketball game. When he got to campus, the defensive end found himself buried on the depth chart behind more highly regarded recruits. In that time, Trey Flowers turned to what he knew best. Trey Flowers carried all these lessons with him to Foxboro. Last year, after a strong start in the preseason, he suffered a shoulder injury and spent the majority of his 2015 rookie season on the injured reserve. It was a challenge to be without football for the first time since he started playing. The 23-year-old focused on his rehab and was ready to go this offseason. He’s still doing pushups (he claims he could get to 70, but if he got there, he’d have to push for 30 more). This season, he’s playing 45.5 percent of the defensive snaps and has appeared in every game. Even when times get tough, he remembers what it was like working on the construction site and how lucky he is to do what he does for a living. For Trey Flowers, that foundation was set a long time ago. From Mitch Smith's article "C.J. Fiedorowicz, Karl Klug Establishing Themselves in NFL"
CJ Fiedorowicz and Karl Klug were Iowa teammates for one season in 2010, and now they’re adversaries in the AFC South. Both have taken a step forward this season, competing at a higher level and making major contributions for their respective squads. And if the Houston Texans or the Tennessee Titans earn an NFL playoff berth this season, quality performances from Fiedorowicz and Klug will have definitely played a major factor in the teams’ success. Karl Klug often played second fiddle as a Hawkeye playing alongside the likes of Adrian Clayborn and Mike Daniels, but the Iowa defensive lineman from 2007-2010 has blossomed into a very productive NFL lineman. 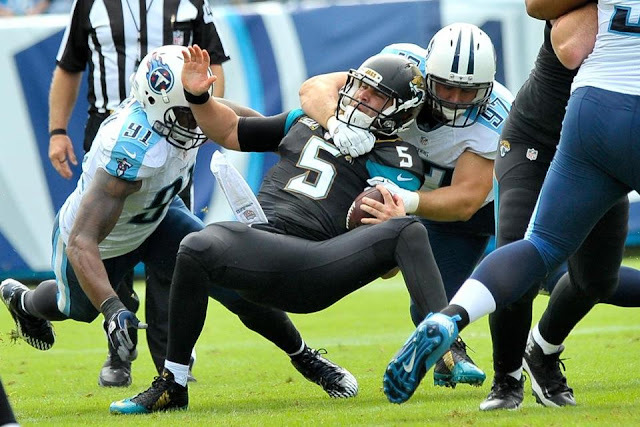 He has appeared in every game for the Titans since his rookie campaign in 2011, racking up 20 sacks, eight passes defended and five forced fumbles. Still, Klug continues to fly under the radar, making only seven starts in his six-year NFL career. Although he hasn’t made many appearances in the starting lineup, Titans second-year head coach Mike Mularkey is taking notice of how valuable the former Hawkeye has been on a defensive unit that ranks 10th in the league in Total Defense this year. Through eight games this season, Klug has 19 tackles and 1.5 sacks. It’s likely he’ll have his third straight season with at least 20 tackles, and he’s on pace to surpass his single-season high of 23 tackles he recorded in 2014. PFF graded Klug as the Titans top defensive player in Week 5, 6 and 7. The website has called the former Hawkeye “one of the best situational players in the league,” giving him an overall grade of 82.1 — tied for ninth-best among the league’s interior defensive linemen. In his 80 run snaps this season, Klug has nine stops and just two missed tackles, and on his 156 passing snaps, he has 17 total pressures — making him the third most productive pass rusher at his position. 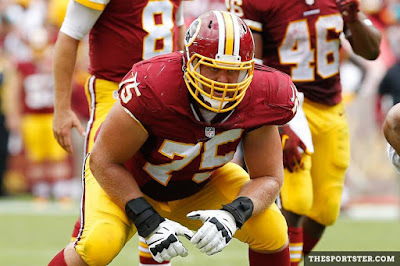 The Washington Redskins took some flack for moving Brandon Scherff to guard after taking him in the first round in 2015. He’s shut the doubters up though. 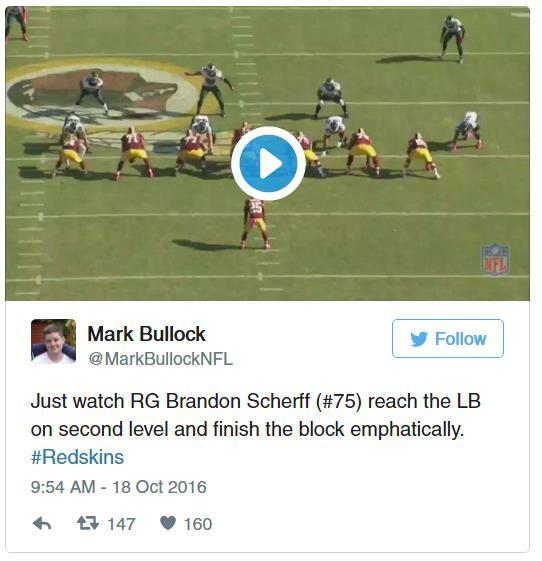 When the Washington Redskins selected Brandon Scherff in the 2015 NFL Draft, he was a right tackle. That looked like the plan moving forward. However, Morgan Moses had something to say about that. The right tackle that was taken in 2014 stepped his game up and won the right tackle spot. With Moses on the end, Scherff moved inside to right guard. This move was met with a ton of complaints. Why would a team draft someone with the fifth-overall pick just to put him at right guard? It’s an important position, but that seems like a stretch, doesn’t it? First off, that’s a ridiculous complaint. 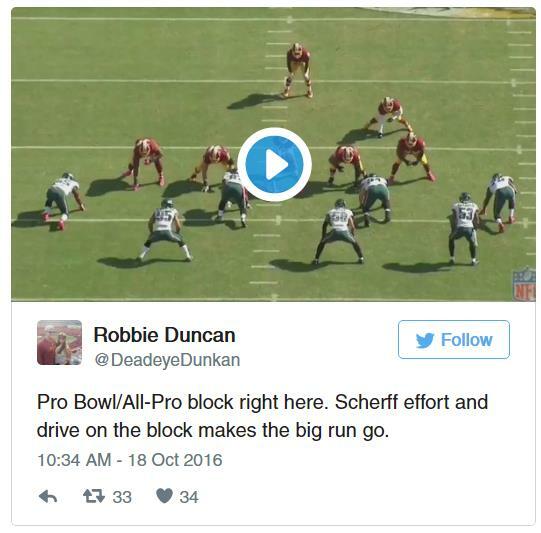 The Redskins clearly needed help with their offensive line at the time, and Scherff was the best in the draft. Second, it’s never too early to draft someone who protects your quarterback. Scherff has made everyone that complained about the move look bad—really bad. In his rookie year, the right guard started all 16 regular season games and the one postseason game for the Redskins. He was named to the All-Rookie team, and even received two All-Pro votes. 2016 has been even better. Scherff has started all seven games at right guard for the Redskins, and has absolutely dominated. 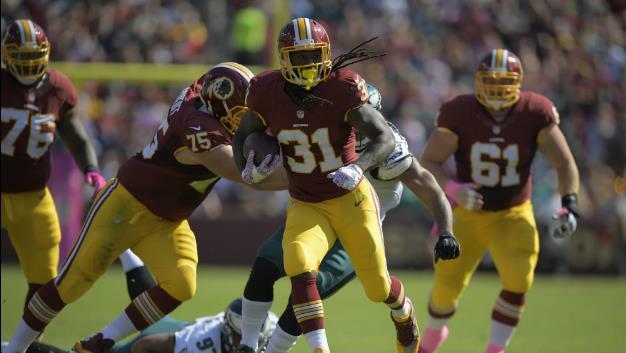 It was never more evident than in the matchup against the Philadelphia Eagles. During that matchup, the outcries for holding on Scherff from Eagles fans were at a numerous. The thing was, he wasn’t holding; he was just dominating. 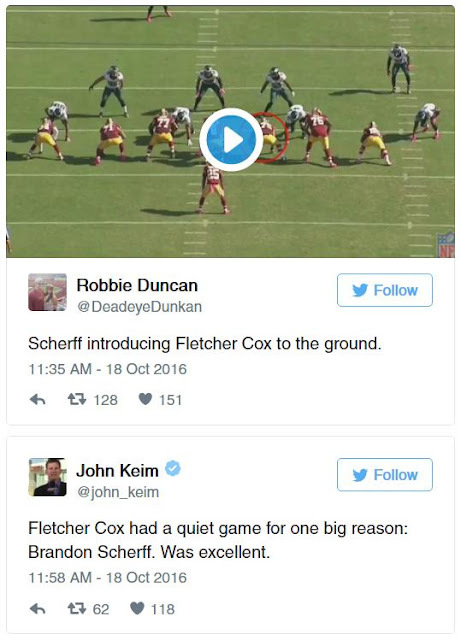 When an offensive lineman makes his opponent (especially someone as good as Fletcher Cox) invisible, though, you start to think there’s holding. See for yourself. This isn’t just a one-week showing though. It’s a weekly occurrence for Scherff to ruin someone’s day by throwing them around. Not even two years into his NFL career and Scherff already has a nickname for the devastation he causes to opponents. His ability to pass protect and create gaping holes for the running game have quickly catapulted him into elite status. The Redskins were almost mocked for using the fifth pick on a right guard. 23 games in and one thing’s for sure: no one’s laughing anymore. While the 10-year veteran never got a lot of attention, tight end Owen Daniels was a big part of the Denver Broncos run to the Super Bowl in 2015. The longtime Gary Kubiak disciple was a major component of the passing game, hauling in 48 passes for 517 yards and three touchdowns during the regular season. The Broncos decided not to bring Daniels back for 2016 and have instead relied on a mixture of Virgil Green, Jeff Heuerman and John Phillips at the position. While the trio has been serviceable—and quite good in the blocking department—it hasn’t added a ton of punch to the passing game. Through seven weeks, Broncos tight ends have combined for 17 receptions, 183 yards and one touchdown. Heuerman is Denver’s highest rated tight end in terms of receiving, per Pro Football Focus, and he’s rated 25th at the position and has seen a mere 85 offensive snaps. For a team looking to make life easier on first-year starter Trevor Siemian, what the team has had at tight end hasn’t realistically been enough. This is likely why the Broncos decided to make the move to acquire A.J Derby from the New England Patriots earlier this week via trade. Assuming Derby can adjust to Denver’s playbook quickly, he has the potential to add an immediate boost to the team’s passing attack. 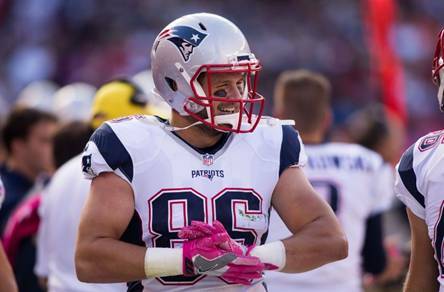 The former quarterback-turned-tight-end was originally selected by the Patriots in the sixth round of the 2015 draft. However, he was placed on injured reserve that summer and didn’t see his first real action until the 2016 preseason. Derby was magnificent during the preseason, though, proving that he is more than just a 6-5, 255-pound athlete. He finished the 2016 preseason with 15 catches, 189 yards and a touchdown. Pro Football Focus rated Derby as the top receiving tight end in the entire league for the preseason. Now, it’s worth noting that there’s a big difference between preseason and the real thing. It’s also worth noting that we’re speculating on potential here rather than proven production. But Derby seems to have all the tools to be a quality receiving tight end in Denver’s offense. Now that Kubiak and offensive coordinator Rick Dennison have their hands on Derby, it will be interesting to see how quickly they can work him into the offense. At best, Derby can provide Siemian with a dynamic receiving threat at the tight end position almost immediately. This should make the quarterback’s life a lot easier, as quality tight ends are apt to do. At worst, the Broncos have acquired a developmental prospect with a ton of upside. If Derby isn’t boosting the passing game this season, he could be when, say, Paxton Lynch is the one taking snaps from under center. 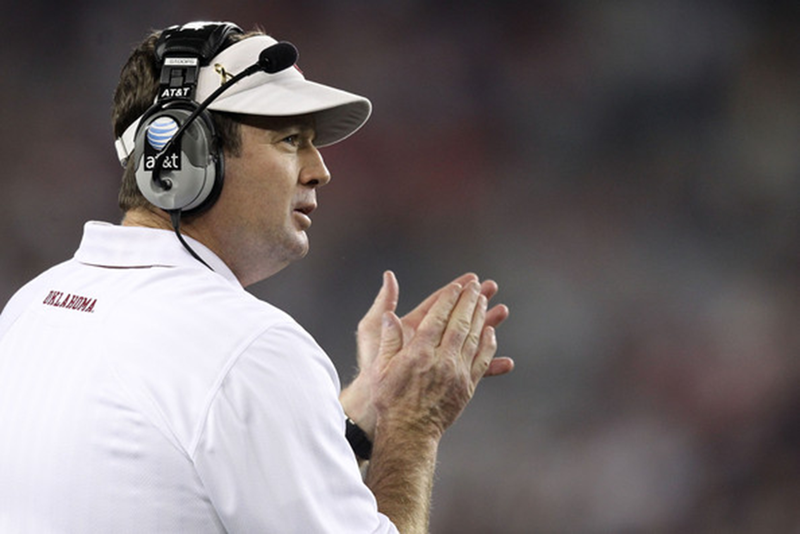 Ten years ago, when USA TODAY Sports first tracked the compensation for major-college football head coaches, making $3 million was a singular distinction belonging to Oklahoma's Bob Stoops. This season, there are at least 36 coaches above that threshold -- or, more than half of the 64 at schools in the five wealthiest conferences: the Atlantic Coast, Big 12, Big Ten, Pac-12 and Southeastern. Leading the way is Michigan's Jim Harbaugh, whose basic annual pay is $7 million but whose total for this season is $9 million because he drew an extra $2million deferred compensation payment in June. Defending national champion and No. 1-ranked Alabama's Nick Saban is making nearly $7 million, and Urban Meyer's pay from Ohio State this year edged just above $6million. Stoops is fourth at $5.55million. On average, head coaches at Power Five conference schools are being paid nearly $3.5million this season. When the season began, there were 20 scheduled to be paid more than $4million, including nine of 14 in the SEC, where the median compensation is nearly $4.2million. No college football coaches had reached $4 million prior to the 2009 season, and only eight were there as recently as 2013. One of the nine SEC coaches above that mark this season, LSU's Les Miles, already has been fired -- and his termination pointed to another area of growth. Because he was let go for not winning enough, he was contractually set to walk away with a buyout approaching $10million prior to his obligation to find another job that would generate income offsetting what LSU owes him. That put him among a group of 33 coaches whose buyouts were set to be at least $8million this year. The leader among that group is Florida State's Jimbo Fisher, who would be owed $33.1million prior to what the university says would be a duty to mitigate. That is slightly more than what Miami (Ohio) spent on its entire athletics program in 2014-15, the most recent year for which schools' annual financial reports to the NCAA are available. Yes indeed: if there were an Agent Hall of Fame, Neil Cornrich would be a first-ballot inductee. 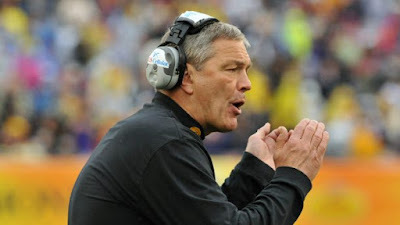 Early last month, Iowa announced that it had reached an agreement with Kirk Ferentz on a new contract that runs through the 2026 season. The details of the contract, revealed as part of USA Today‘s annual coaching salary database release, negotiated by Cornrich and agreed upon by the university are staggering. — Even if he’s fired after this season for not winning enough games, the 61-year-old Ferentz would be owed more than $25 million, payable in monthly installments until 2026. — He’s guaranteed an additional $22 million from 2021 through 2025 if he sticks around and wins at least seven games each season through 2020. It wouldn’t matter if he’s dismissed in 2021 after finishing 0-12. — If that’s not enough, those guarantees wouldn’t even be reduced if Iowa fired him and he took a lucrative new job somewhere else. Another Cornrich client, Oklahoma’s Bob Stoops, would be owed nearly $25 million if he were fired today without cause. All told, there are at least seven head football coaches, the paper writes, “who would be owed at least $20 million in guaranteed money if he were fired on Dec. 1 for losing too many games.” Jimbo Fisher tops the buyout list, with Florida State on the hook for $33.1 million in the improbable event that Florida State dismisses him. Others with the $20 million-plus golden parachute include Ohio State’s Urban Meyer ($27.4 million), Michigan’s Jim Harbaugh ($25.6 million), Alabama’s Nick Saban ($23.3 million), Clemson’s Dabo Swinney ($20 million). Another, Illinois’ Lovie Smith, is just shy of that mark at $19.3 million. Of the four coaches already dismissed this year, Les Miles had the highest buyout with LSU owing the former coach nearly $9 million according to the paper. Darrell Hazell is due $5 million from Purdue, while Fresno State will owe Tim DeRuyter $3.3 million and FIU will shell out $609,000 to Ron Turner. Texas will owe Charlie Strong just north of $11 million if, as expected, they fire the coach at season’s end. The multimillion buyouts are part of a burgeoning trend all across the sport. In 2011, there were 15 coaches with guaranteed buyouts of at least $8 million. This year, at least 33 are guaranteed that much — well more than half of the 53 publicly available coaches contracts in the Power Five conferences. When it comes to actual salary being paid in 2016, Saban would sit atop the list at $6.9 million. However, Harbaugh is the highest-paid coach in college football at $9 million, with $5 million of that coming in salary and $4 million in the form of insurance payouts. In 2006, the first year the USA Today database was published, there were eight head coaches making at least $2 million annually. A decade later, that number has risen to 58. Hiring a college football coach is expensive. Firing one is, too. On a warm, sunny day last month at the University of Iowa, head football coach Kirk Ferentz wore a white shirt and gold-striped tie to a special announcement about his future. He had just signed the deal of a lifetime — the biggest contract of his life, with enough guarantees to make him a rich man well into his retirement, win or lose. ► Even if he’s fired after this season for not winning enough games, the 61-year-old Ferentz would be owed more than $25 million, payable in monthly installments until 2026. ► He’s guaranteed an additional $22 million from 2021 through 2025 if he sticks around and wins at least seven games each season through 2020. It wouldn’t matter if he’s dismissed in 2021 after finishing 0-12. ► If that’s not enough, those guarantees wouldn’t even be reduced if Iowa fired him and he took a lucrative new job somewhere else. “I certainly appreciate the trust and confidence demonstrated by athletic director Gary Barta,” said Ferentz, who also thanked Iowa president Bruce Harreld. Less than two months later, Iowa has lost three consecutive home games, adding more buzz to a popular question about contract guarantees for college coaches: Why? Why did Iowa make Ferentz almost too expensive to fire after averaging about seven wins per season during his previous 17 years in Iowa City? And why are schools, including Iowa, increasingly willing to provide gold-plated parachutes for coaches in an industry where their success is never guaranteed? Harreld, the top decision-maker on Ferentz’s contract, declined comment. But the simple answer is leverage. Buoyed by rising revenues in college sports, college football coaches are getting paid more than ever, with at least 36 earning at least $3 million this year, up from nine in 2011 and one in 2006 — the first year USA TODAY Sports conducted the head coaches salary survey. They also have more bargaining power than ever and are using it to guarantee their pay at unprecedented levels to match. From the schools’ viewpoint, that means the potential price of failure has skyrocketed, according to a USA TODAY Sports analysis of hundreds of coaches’ contracts obtained over several years. Ferentz is one of at least seven football coaches who would be owed at least $20 million in guaranteed money if he were fired on Dec. 1 for losing too many games — a list led by Florida State’s Jimbo Fisher, whose buyout this year would be a little more than $33 million. In 2011, there were 15 coaches with guaranteed buyouts of at least $8 million. This year, at least 33 are guaranteed that much — well more than half of the 53 publicly available coaches contracts in the Power Five conferences. The buyout boom isn’t just caused by the rising pay market, experts say. In some cases, schools appear to be getting out-leveraged in contract negotiations by coaches and their agents, perhaps because multi-year contract signings are usually sunshiny occasions. With so much optimism in the air at the time, schools might not be considering the dark possibility that the honeymoon might not last. ► Those fired for legal cause, such as breaking the law or major NCAA rules. In these cases, coaches generally aren’t entitled to additional guaranteed money. ► Those fired for losing too many games — which almost always entitles coaches to additional guaranteed money from schools according to their contracts. This is the most common type of firing (17 of 33 coaching changes since the start of the 2015 season), and the terms of divorce are usually set before marriage or renewed vows during contract negotiations, as they were with Ferentz’s guarantees. “We’re going to call that a sweetheart deal” for Ferentz, Greenberg said. Many others could be described the same way, and arguably for good reason: Coaches are helping drive those rising revenues. With contract guarantees, coaches also taking what they can get from the market and ensuring themselves some stability in an otherwise turbulent profession. Consider Texas, where many are speculating about the future of Charlie Strong, whose record in three seasons is 14-18. If he’s fired in December, Strong would be owed more than $11 million. By contrast, Strong’s predecessor at Texas, Mack Brown, never had a potential buyout larger than $3.5 million from 1998 until his resignation in 2013. 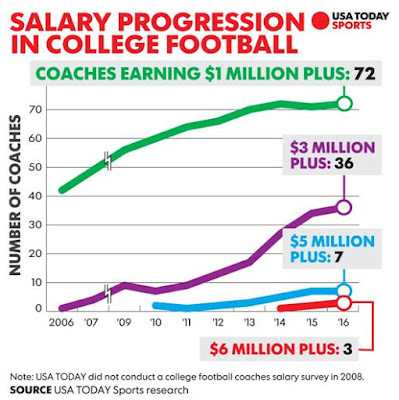 Coaches these days “are in the driver’s seat,” Stanford economist Roger Noll told USA TODAY Sports. On the other side of the bargaining table, schools are taking on even more risk with these contracts — at least until they decide they can’t. Just ask Kansas, which recently bucked the big buyout trend after getting snake-bit by it several times. It started in 2001, when Kansas fired coach Terry Allen with one year left on his contract at an annual salary of $320,000. Since then, the Jayhawks have paid three coaches not to coach. ► In 2009, one year after Kansas' last winning season, coach Mark Mangino received a $3 million settlement from KU after quitting amid allegations that he mistreated players. The settlement helped KU avoid a fight for the $6.6 million Mangino would have been owed if he were fired without legal cause. ► Coach Turner Gill succeeded him and went 5-19 in two seasons before KU fired him in 2011 and bought out the remaining $6 million left on his contract. ► KU then turned to Charlie Weis, the industry legend for making a living off of getting fired. Before KU, Notre Dame terminated Weis after a 6-6 season in 2009 and subsequently paid him more than $16 million to settle his contract, with a final payment remaining at the end of 2015. At KU, Weis did it again. He compiled a 6-22 record before getting fired in 2014 with more than $5.4 million still owed to him in monthly installments, the last of which is due in December. To replace Weis, KU hired David Beaty and this time drastically changed the buyout provisions in the school’s favor. If he’s fired for losing, Beaty’s buyout is to be no larger than two years’ pay ($1.6 million total), according to his contract. He also would be required to seek “similar or related employment” and reduce his buyout from Kansas by the amount of pay he receives at his new job — a contract provision that is common in college football but also negotiable. Beaty’s record at KU so far is 1-18. Kansas officials declined comment on the contract through a spokesman. But there’s still a tradeoff for the Jayhawks, no matter how sensible Beaty’s contract might seem for them. Such deals won’t attract the kind of big-splash hire they might have wanted instead — the kind that Michigan got in late 2014. With $9 million owed him this year, Michigan coach Jim Harbaugh is the highest paid coach in the 2016 USA TODAY Sports survey of publicly available contracts. He’s at the top, in large part, because he has huge leverage, an example of why schools fawn over star coaches and give them much of what they ask for during contract negotiations. All schools want a coach like him — somebody who can turn a flat brand name into a shiny national power practically overnight. Before Harbaugh, Michigan had sagged to a 5-7 season under Brady Hoke, who was owed $3 million for his termination in 2014. After hiring Harbaugh, Michigan’s football team has become an undefeated, top-two program and likely an even bigger cash cow after contributing $88 million of the athletic department’s $152 million revenues in the fiscal year ending in June 2015. The problem for schools is that there’s a very limited supply of coaches of this caliber. “Part of what is going on is the iron law that only 25 schools can rank in the top 25,” said Noll, the Stanford economist. Yet there are 128 teams in major college football. About 20 coaches are capable of being consistently in the top 25, Noll estimated, with about 50 to 75 programs able to generate enough revenue to be among the bidders for one of these coaches. So the bidding increases, bringing the rest of the market up with them as each school chases more wins and more revenue with more spending. “Coaches are better positioned in today’s market to negotiate guaranteed deals,” attorneys Russ Campbell and Patrick Strong said in a statement to USA TODAY Sports. They would know. Their firm, Balch Sports, has negotiated more than $350 million in coaching contracts since 2007. No other major college head football coaches have been at the same schools longer than Ferentz and Oklahoma’s Bob Stoops, both of whom were hired at their respective schools in late 1998. The two happen to be friends and share the same agent: Neil Cornrich, who is based in suburban Cleveland. They also have two of the top buyouts in the nation at about $25 million each, a byproduct of their recent success and the stability they’ve brought to their programs. Cornrich declined to comment on contract negotiations but made a case for why the relatively long tenures of Ferentz and Stoops have added value to their schools. Ferentz’s new contract this year comes on the heels of a 12-2 season last year, after finishing 19-19 the previous three years. If Iowa had insisted that Ferentz’s buyout provisions be less generous, it’s hard to say what Ferentz would have done instead, though he has been mentioned for other jobs in previous years. Unlike at many other universities, the board of regents that oversees the University of Iowa does not review or approve coaching contracts as a matter of policy. Some say such oversight is necessary because these contracts involve such huge financial commitments. “This might be a very good wakeup call to the board to be more proactive to ensure they can exercise their fiduciary responsibilities in a more robust way,” said Michael Poliakoff, president of the American Council of Trustees and Alumni (ACTA), a nonprofit committed to accountability in higher education. The Board of Regents for the State of Iowa delegates this oversight at Iowa to President Harreld, who was hired last year. Ferentz and Iowa athletic director Barta declined comment to USA TODAY Sports through a spokesman. Whatever happens, rising revenues still might be able to cover much of Iowa’s rising costs, even if a hefty buyout is in order. Iowa’s Big Ten Conference distributed roughly $34.6 million to each of its 11 longest-standing members during the fiscal year ending in June 2016 and is projected to distribute more than $38 million in 2016-17. That’s expected to go up even more with a new television deal with Fox and ESPN. From Kiernan Hogan's "IND-TEN Grades: Andrew Luck Impresses Despite Poor Pass Protection"
Here are the top-graded players and biggest takeaways from Indianapolis’ 34-26 win over the Titans. Indianapolis’ defense was unable to consistently apply pressure on Titans QB Marcus Mariota, but Mariota struggled mightily on his few snaps without a clean pocket. The Colts’ pass-rush got pressure on just 10 of Tennessee’s 40 pass plays, finishing with three sacks and forcing Mariota’s QB rating to drop by more than 65 points on his seven pressured attempts. 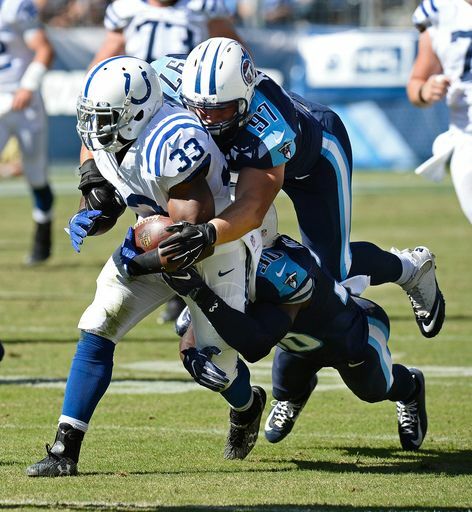 The Titans’ offensive game plan was built around the run game and short-to-intermediate passes (zero-for-three on passes thrown 20+ yards), and the Colts were able to put the game away with a strip sack that they returned for a touchdown late in the fourth quarter. The Titans currently rank first in the NFL in team run-blocking grade, and second in team pass-protection grade, making a case for the best and most-balanced offensive-line unit in the league. Tackles Taylor Lewan and rookie Jack Conklin have been tremendous this season; Lewan leads all NFL tackles in both overall grade and run-blocking grade, and Conklin is our second-highest graded right tackle. Neither player has allowed a sack in 2016. RG Josh Kline was actually the highest-graded lineman in this game, after not allowing a single pressure on his 45 snaps in pass protection, and earning an 83.7 run-blocking grade. HB DeMarco Murray took advantage of the strong work in front of him by producing consistent gains (25 carries for 107 yards and a touchdown, two broken tackles), but was unable to break off a run longer than 14 yards to change the course of the game. While they were able to generate pressure on nearly half of their snaps in pass defense, it was not enough to make up for the struggles of the back seven in coverage. DE Karl Klug (one sack, three hurries, one batted pass), OLB Derrick Morgan (two sacks, three hurries), and OLB Brian Orakpo (five hurries) were in the backfield all day long, but were unable to force a game-changing turnover. Luck picked on linebackers Sean Spence and Avery Williamson in coverage, finishing nine-for-nine for 88 yards and two touchdowns when targeting one of them. CB Jason McCourty was also responsible for a pair of deep completions, including a 37-yard touchdown to T.Y Hilton. Rooting for the Cleveland Indians is a natural for Jamie Meder, and the 'Pride of Parma' is living the dream as one of the Browns' bright spots. Jamie Meder works at 76 Lou Groza Blvd., six miles from where he went to high school. It's all northeast Ohio for him in the Battle of Ohio. Playing nose tackle for the Browns really is Meder's dream job. He is a feel-good story in a feel-bad season, a good-natured, hard-working, underdog of a battler who has made himself good enough to maybe be around if the good times ever roll. "Of course," Meder says when asked if he is fired up about the Indians, who are in the World Series for the first time since he was in first grade. He never saw himself working in the shadow of the Bob Feller statue. "I played baseball," he said after a practice for today's game at Cincinnati. "I was not a good baseball player." His father played football at Bowling Green and Baldwin-Wallace and coached him from an early age. "I think I get my toughness from my dad," Meder said. "It starts with him. Getting beat up on by my older brother always helped (he laughed). "I always dreamed of being in the NFL. The Browns were always my team. I was born in '91, so I only heard people talk about the old days and the playoff teams." "I was 8 when the team came back in '99." Meder's sports talent was in the brawling line. He wrestled. He boxed. He played well enough at Parma Valley Forge (his number is retired) that he could have been a defensive lineman at just about any college. His grades needed work. Ashland head coach Lee Owens thought Meder could be dominant in NCAA Division II and helped him get his books in order at Cuyahoga Community College, a short walk from Valley Forge. "It was evident very early at Ashland that Jamie was going to be a very good player for us," Owens said. Meder became a four-year star who was — and is — well liked in Ashland. When he makes a play, people walking around campus hear cheering coming from the dorms, where TV ratings for Browns games were never better. Meder is well liked in Berea 76, as well. "You want to talk about Jamie? The pride of Parma?" The speaker was left tackle Joe Thomas, who has observed Meder on the other side of the Browns' line since November of 2014. 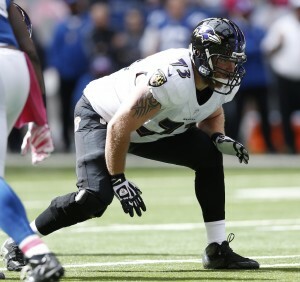 Meder's first NFL camp was in Baltimore, where he arrived undrafted in 2014 and made the practice squad. The Ravens released him that November. The Browns put him on their practice squad the next day. He was promoted to the active roster in time to play in the season finale, at Baltimore. In 2016, Meder played in all 16 games in the defensive line rotation. "Jamie has proven he can play at a high level," then-head coach Mike Pettine said last year. "If you had to vote for our most improved player, Jamie would be in that discussion." He proved himself to a new staff in the spring. His role has expanded. In the most recent game, at Tennessee, he played 43 snaps, the same number as 2015 first-round pick Danny Shelton. "The first thing you notice is his all-out effort," said Thomas, the nine time Pro Bowler. "He's relentless. He keeps improving. He shows a lot of football savvy and smarts." Meder and guard John Greco constitute the Browns' fraternity of former northeast Ohio high school football players. "We talk about that," said Greco, from Boardman. "It's good to see him doing well. When he first got here, he was more of just a power guy, but he's added to his game. He can use power and moves now." At 6-foot-3, 310 pounds, Meder has been a factor in an improved run defense. He can move around on the defensive line and has sharpened himself against all of the Browns' offensive linemen. "He can bull rush just about anybody," right tackle Austin Pasztor said. "But he's also really good with his hands, which makes him tricky to block." Meder, 25, assumes nothing about his NFL future, other than he must pour himself into his work in order to keep it. Sometimes he has to pinch himself to remember that playing for the team he loves is reality. "There's a little bit of that," he said. "I'm doing something people dream of doing. But … you're here. You've got to take it professionally." Meder is a survivor, one of only two defensive players acquired in 2014 who are still on the roster. His family and his buddies from Parma and Ashland keep him honest. They are his biggest fans and toughest critics. The NFL pays well. Recently, he bought a house in Brunswick, a short highway drive from the team complex in Berea. He enjoys being able to maintain "those everlasting friendships you built with kids you played with in the back yard." "Eventually," he said, "I'm going to be working with them again." He majored in criminal justice at Ashland. "I thought I wanted to be a cop," he said. "I'm not sure now ... I might go into coaching. We'll see where I'm at." For now, he is in the middle of the Browns defensive line, wearing No. 98. "Life hasn't changed too much," he said with a smile. "I'm able to eat at nicer restaurants." Browns fans are starving for a winner. A lot of people are rooting for Meder to be at the table when it happens. The coaches thought these players best prepared the team to beat the Bengals. The New England Patriots have announced 4 practice players of the week from the team’s victory over the Cincinnati Bengals. The four players are DE Trey Flowers, DT Anthony Johnson, RB Bishop Sankey, and WR DeAndrew White. Players are awarded for their work on the scout team. 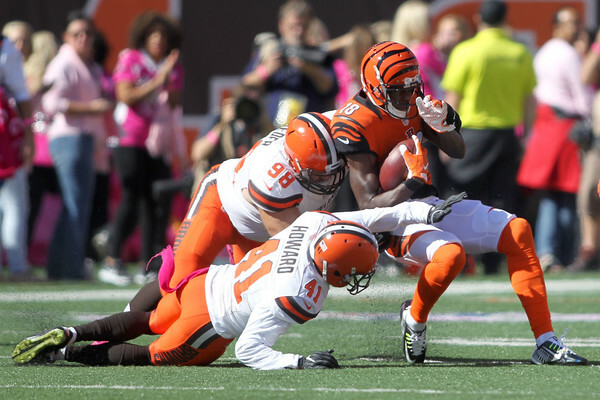 Flowers likely served as Bengals pass rusher Carlos Dunlap in practice. OT Marcus Cannon had his best game of the season after this past week of practice. Johnson was probably Bengals star defensive tackle Geno Atkins. LG Joe Thuney played well against great competition. Atkins is regarded as a top five defensive tackle in the NFL. Sankey could have been either Bengals running back- Giovanni Bernard or Jeremy Hill. The Patriots did a good job of bottling up Hill all game, while Bernard was quiet in the second half. White might have been Bengals WR A.J. Green, despite being four inches shorter. The Patriots did a good job against Green when in one-on-one coverage and they didn’t allow Green to take over the game. 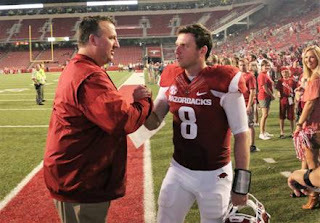 HOUSTON – Arkansas head football coach Bret Bielema was one of 23 coaches named to the watch list for the American Heart Association (AHA) Paul “Bear” Bryant Coach of the Year Award, the AHA and Marathon Oil announced Wednesday. Bielema has led the Razorbacks to a 5-2 (1-2 SEC) start through seven games this season. Arkansas is No. 17 in both the Amway Coaches poll and Associated Press Top 25 poll, following its second win over a ranked team this season and third straight against Ole Miss. The Razorbacks have been in the national rankings for six straight weeks, which is the program’s longest run since 2011. Arkansas’ 34-30 win over No. 12 Ole Miss last Saturday night marked Arkansas’ fourth victory over a ranked team in its last six attempts. The Razorbacks have won 11 of their last 14 games dating back to their four-overtime win over Auburn in 2015. Bielema and the Razorbacks are set for their third straight game and fifth this season against a ranked opponent as it travels to face No. 21 Auburn on Saturday for its first true SEC road game of the year. It will be the 23rd time in his 46 games as head coach at Arkansas that Bielema has taken on a ranked opponent. The Coach of the Year Award is the only college coaching honor presented after all bowl games are concluded. It is voted on by the National Sports Media Association and has honored many of the game’s greatest leaders. Five to 10 finalists will be announced this December. The winner will be announced live on Jan. 11, 2017 during the awards banquet in Houston at the Toyota Center. After 10 seasons of grading NFL games, PFF founder Neil Hornsby assembles our first All-Decade Team. Ten years of grading. That’s the breadth of data now amassed in the Pro Football Focus system, and it’s a milestone worth commemorating. When we started the site, it was all about player evaluation: Who had played well, but went unnoticed? Who had unfairly received hype without the associated production? Therefore, what better way to mark a decade of grading than with a PFF All-Decade team (2006 to 2015 seasons)? Selection criteria was always going to be the trickiest thing. When you have as much data as we do (more than anyone else by an order of magnitude), you should be able to compare players pretty accurately. But how do you balance longevity with production? In the end, beauty was in the eye of the beholder, and that (for my sins) turned out to be me. I did ask a couple of the longer-tenured PFF analysts (Ben Stockwell and Khaled Elsayed) for their opinions, but a democracy this was not. What you see is ultimately my view of our first 10 years, and for that, I accept all the criticisms (and maybe a few scattered plaudits). Here’s how ridiculously good Marshal Yanda is: if he’d stayed at tackle, Yanda would probably have made this team at that position, too. Early on with Baltimore, he was in fact a right tackle. In 2007, he was our third-ranked tackle with a 90.3 grade, and he was still moved inside—such are the vagaries of the NFL. It didn’t matter, though, because in the last five years, he’s averaged a 90.7 grade and been our top-graded guard the last two seasons. Brandon Scherff doing some dirty work behind the scenes. WASHINGTON — Offensive linemen may never get the respect they deserve, but one of the more exciting post-game rituals to come out of the first six weeks of this NFL season has been admiring Redskins guard Brandon Scherff blowing up defenders. After nearly a season and a half of watching Scherff, there’s no question why GM Scot McCloughan didn’t hesitate when drafting him fifth overall. Guard, tackle, center, no matter — put this rugged, boorish human anywhere on the line and he will ruin someone’s day. Confession: I can’t stop watching Scherff pancake highlights. I’ll seek them out in whatever deep, dark corners the internet takes me. It’s quickly become a part of my weekly day-after-game routine. 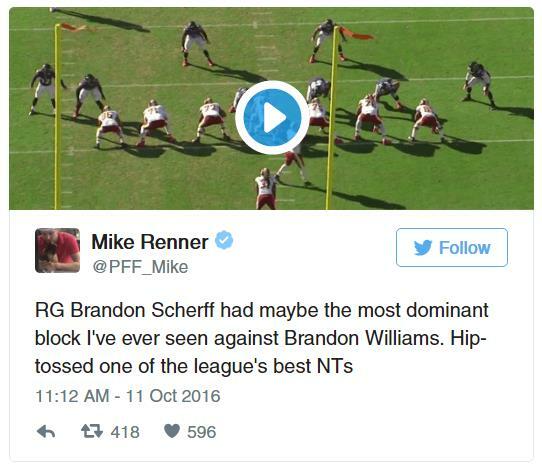 Here’s Scherff treating Ravens nose tackle Brandon Williams like a rag doll in Week 5. Fletcher Cox may be an All-Pro defender, but Scherff reminds him here that the fall is a lot quicker than the climb. Scherff gets to the second level on this play and immediately has his way with a linebacker. Here’s Scherff opening up a running lane for Matt Jones (h/t Trent Williams for the pancake block on the back side). If only there were an easy-to-remember catchphrase which could succinctly reconcile the chaos and embarrassment of a Scherff block. See you guys back here next week. Follow @ChrisLingebach and @1067TheFan on Twitter. IOWA CITY — Kirk Ferentz wondered aloud Tuesday during his weekly media availability if he could "get a couple snaps out of" former Iowa and Indianapolis Colts tight end Dallas Clark on Saturday against No. 10 Wisconsin. 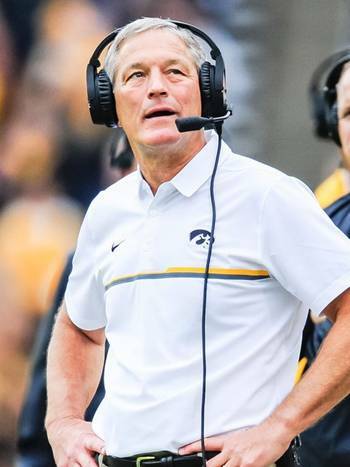 While that ship might have sailed — "I think that might go detected," Ferentz said — Clark will be in Kinnick Stadium as the honorary captain and to be inducted into Iowa’s ANF Wall of Honor. Ferentz’s joke got a laugh, but Clark would if he could. He’s around a lot as it is, and still works out with the team when he can. Clark’s presence around the Iowa football facility isn’t only welcome, it’s encouraged. Clark moved back to Iowa to run the Dallas Clark Foundation that benefits Humboldt and Kossuth Counties, as well as to oversee the running of a 135-acre family farm outside his hometown of Livermore. So like he said, whenever he can, he comes back to Iowa City. 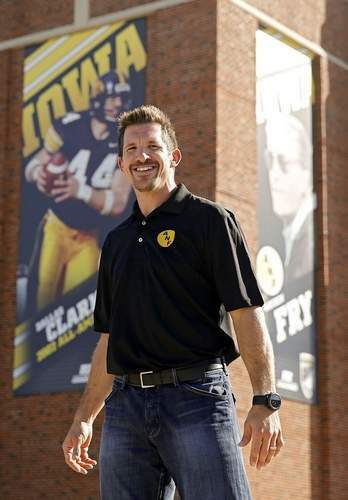 While helping with the Back Porch Revival concert in August, Clark spent his free time at Hawkeyes’ camp, working out with the current players and going through the same rigors Doyle put him through from 1999 to 2002. Ferentz has, essentially, an open-door policy with his former players and when they’re around, he wants them to embed the history and meaning of the program into the current guys. Clark’s work ethic post-NFL is just a continuation of what he was as a Twin Rivers High School athlete, as well as a Hawkeye. He got his start at Iowa as a walk-on linebacker just hoping to play special teams, mowing the Kinnick Stadium grass during his gray shirt year in 1998. He ended his career with a year of eligibility left, leaving to become a Super Bowl champion and All-Pro with the Indianapolis Colts. He joked he doesn’t think he’s worn out his welcome at the Iowa football facilities yet, but it’s probably not possible for that to happen given what he tries to do when he’s around. Clark’s journey to such a successful career included Hayden Fry and that Iowa staff being the only Division I school to give him a look, then Bret Bielema vouching for him during the staff change and then Ferentz fostering the move from his original linebacker spot to tight end. All along the way, he had people to lean on, and wants to be that for whoever needs or wants him to be. Clark will serve as the honorary captain Saturday, when he also becomes the fifth former player inducted into the ANF Wall of Honor — joining Casey Wiegmann (2012), Jared DeVries (2013), Bruce Nelson (2014), and Robert Gallery (2015). His work as a “hobby farmer” on the farm that’s been in his family for more than 100 years is part of a post-NFL life that might include coaching down the road — but nothing past the high school level. If being around the Iowa football facilities has taught him anything, he said, it’s that he doesn’t want that level of stress in his life. Whether it’s lifting weights with current players or milling around the facility to lend his thoughts, Clark has been around and likely will be around plenty going forward. While expressing his gratitude for everything, Clark also reminded everyone it’s not always this way with former players and college football programs across the country. He said he’s taking advantage of the fact that his college coach is still around while he can, because he genuinely loves being back. Fourteen years after leaving for the NFL Draft, Iowa City and the Iowa football building are the same places they’ve always been to him — even if it’s a little fancier inside the Hansen Performance Center than it was in the Jacobson Athletic Building when Clark was in school. “There’s not many places, 18 years down the road, where your coach is still the coach. It still feels like home,” Clark said. “It’s the familiar faces, it’s the people who helped me become the player I was. If there’s a new coach in there, a lot of coaches have different agendas on how they approach past players. It’s still very easy for me to come in here, work out with the guys, be available; be accessible.